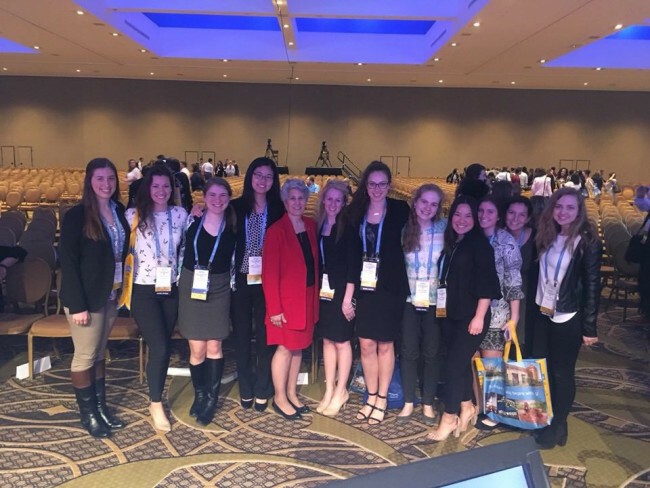 Penn Nursing Students with former ANA President, Dr. Pamela F. Cipriano, at the 2018 NSNA Convention in Nashville!Student Nurses at Penn is the largest nursing student organization at the University of Pennsylvania. SNAP is a chapter of the National Student Nurses Association. NSNA registration is separate, and you can sign up for NSNA here.​ Only $45 a year secures you great opportunities to network, meet other nursing students, discounts on books and NCLX reviews, scholarships, and more! Our members have taken advantage of leadership opportunities at the state and national level, and have also presented resolutions at NSNA conventions. The Student Nurses Association of Pennsylvania is the among the largest of NSNA state constituents, bringing together students from other reputable nursing programs in the state. Our chapter attends events such as the annual SNAP Convention each November, as well as other events centering on leadership and policymaking. Every year, we present resolutions, students run for state board, win scholarhips, and more. If you’d like to take advantage of pre-professional development trips like these, event registration info will be in weekly SON emails. Please email Julia Ann Kennedy at jakenn@nursing.upenn.edu to be added to the listserve or fill out this tinyurl.com/joinsnap18! Explore this page and the tabs on the right! There are many resources available to help you navigate through Penn Nursing just at your finger tips. We cater our events to YOU. Email mnigro@nursing.upenn.edu if you would like to collaborate with SNAP on events or if you have an idea.